As some of you who have been following me know, I like to do some writing here and there. I have done Nanowrimo twice in the past few years and both times I successfully completed the 50,000 word goal on both attempts. I won't be competing this year, because I would like to actually finish the two previous novels that I wrote for it. So for my writing I have been using Evernote. Many people use Google Docs, Word or even some specialized writing apps like Scrivener. I have liked using Evernote. It is a super clean and simple interface and I was able to keep my writing notes and the writing itself all together in one location. Evernote has some basic text formatting, but that is really all I need for writing. All of the bells and whistles that Word has just aren't necessary. Evernote's desktop application presented two major issues for me when writing. The first, it did not have a "night mode" in the app. Everything is white and it made working on a document in the evening really stressful on the eyes. Second, was that the management of the text size was a bit cumbersome. I like to work in a minimized interface and at times having the text nice and "big" on the screen helps to keep me focused. Over the past month or so I have been doing some testing on an alternative. 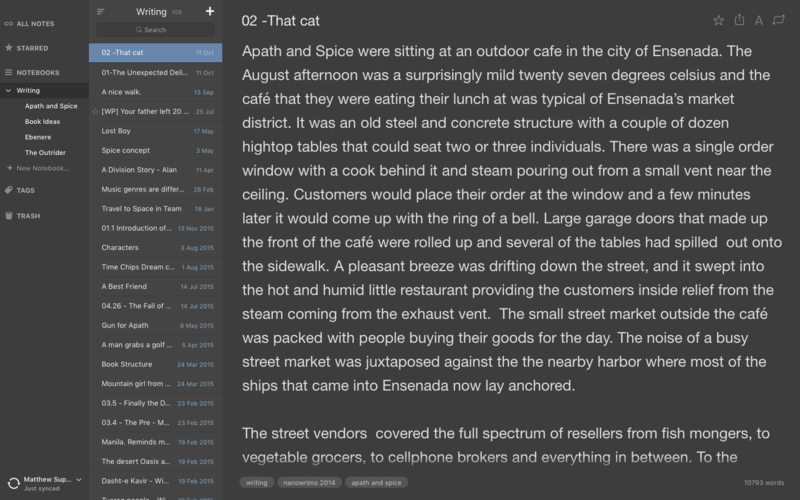 I settled on an app called Ulysses, which I had demo'd for a few weeks. It had just about everything I wanted, including the customizable night mode and some other features. It wasn't perfect though as the text was justified to the left in the minimal interface and it was also $35. Not crazy expensive, but not cheap either. Just when I was about to pull the trigger on Ulysses though I found an app called Alternote. It is basically an alternative app for Evernote which happens to have all of the features I was looking for. Even better was that I was able to sync just the notebooks I wanted to (my writing notebooks) to keep the workflow efficient. A couple of other nice touches are that it shows me the word count right on the bottom right of the screen, and the text size can be adjusted with a slider if needed. Best of all. It was $7 on the app store. If anyone is looking for a nice writing app, and you are using Evernote, or if you just are looking for an alternative Evernote client on Mac, give this app a look. Spice’s hands clenched the steering wheel of her rental car as anger began to build up inside her. Waves of heat rose up off the front of the car as the temperature outside on the highway was a blistering 142 degrees. Traffic on intermodal 1 backed up for miles and crawled at a snail’s pace and accordion-like pockets opened up and then closed again as drivers moved through the stacked assemblage of cars. The aerial beacons for the airway system were offline and everyone was now stuck to surface transportation for the afternoon. “Look at these assholes,” she flipped off the driver of a red car that just squeezed in front of her. Her head turned to her left, to the passenger seat. Sitting there was Apath, her husband, co-pilot, and much calmer individual. He looked up from his cellphone with a look of disapproval on his face, saying nothing. The returning glare from Spice shut Apath up. Apath tried to lighten the mood by putting on a little bit of music. “Look, let’s just calm down a little bit. It’s hot out, but the air conditioner is working fine, we got some music, and the cake isn’t going to melt. If we are a bit late to Anna’s birthday, the world won’t exactly come to an end." he said. Anna was Spice’s niece and she was turning fifteen today. Spice and Apath were heading to her party and Spice insisted on bringing a cake that she made, despite indications from her sister that there would be plenty of food. Apath touched a couple of buttons on the phone that he was still holding and a deep thump of minimalist techno came on over the car’s speaker system. It was a slow rhythmic beat with a soft, but deep kick drum and a short but smooth hi-hat. Over top of the percussion was a light dance of melodic synth lines, that were filtered just a bit to take off the edge. The whole track had a slightly muffled sound to it and Apath knew that this sort of music always seemed to relax Spice. He set his phone onto shuffle before going back to browsing the latest news feeds.